David G. Shainberg, DPM - Poplar Podiatry, P.C. 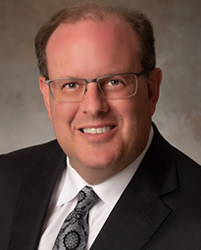 Dr. David G. Shainberg, a native Memphian, is Board Certified by the American Board of Foot and Ankle Surgery and is a Fellow of the American College of Foot and Ankle Surgeons. He received his undergraduate degree from Indiana University and his Doctor of Podiatric Medicine degree from the William M. Scholl College of Podiatric Medicine in Chicago, Illinois. He completed his surgical residency at Rush-Presbyterian-St. Luke's Medical Center in Chicago, where he also served as chief resident in his final year. He has an appointment to the Adjunct Clinical Faculty of the Barry University School of Podiatric Medicine as a Clerkship Director. Dr. Shainberg entered private practice in Memphis in 1996 and has been very involved with the podiatric profession on both the local and national level. He was a member of the Board of the Memphis Podiatric Medical Association for several years, and is also a member of the National Board of Podiatric Medical Examiners that meets in Washington, D.C. In addition, he is the Vice President of the Medical Staff at the Memphis Surgery Center and also serves on various committees there including the Governing Board, the Credentialing Committee, and the Internal Review Board. Dr. Shainberg is married with two daughters. He participates in various local, civic activities. He has also been an active community volunteer, including involvement in local Health and Fitness Fairs to promote public awareness about foot care and to provide foot screenings for at risk patients, including diabetics. He also previously served as President of the Memphis chapter of the Indiana University Alumni Club. Dr. Shainberg received numerous awards as a medical student including the Aaron Abramson Outstanding Medical Student Award, Fund for Podiatric Medical Education: Region Ten Dr. George E. Clark Scholarship, Dr. John E. Forrette Phi Alpha Pi Scholarship, and Who's Who Among Students in American Universities And Colleges. Dr. David Shainberg is dedicated to providing quality foot care using the latest medical and surgical techniques to meet the needs of the Memphis and Mid-South community. He frequently attends continuing medical education seminars around the country in order to stay current with the evolving changes and advancements in the medical and surgical treatment of the foot.